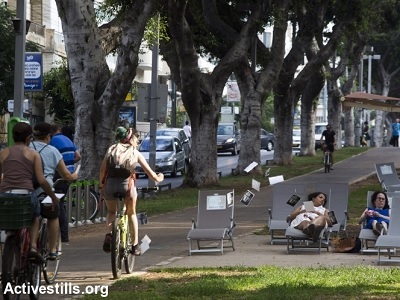 A few weeks ago, just days before Israelis headed to the polls, an Arab teenager was arrested on Tel Aviv’s famed Rothschild Boulevard at around 6 p.m. I have no idea who he is, what he did before he was arrested, where he came from or where he is now. Perhaps he stole something, or perhaps he planned to steal or cause harm. He looked no older than 13, maybe 14. A teenager. In this story, I am the local, a passerby who is walking her dog when she sees a strange sight: a young boy handcuffed to a policeman in civilian clothing, with a policewoman walking next to them. “Why are you trying to escape, huh? You thought we wouldn’t catch you?” asks to the policewoman. He looks frightened. I ask him how old is he, but he remains silent. I asked if the officers explained his rights to him, if anyone knows he has been arrested. “He’s a shabakhnik. [A Hebrew term for Palestinians who enter Israel illegally without a permit.] You want a shabakhnik on your street?” asks the policewoman. He is just a teenager, and to tell the truth, I don’t really care whether he is on my street. I ask again whether he knows his rights, whether they are planning on notifying relative know that he was arrested. I know that the number of Palestinian minors who were arrested without notification went up this year. Children are arrested for six hours, 10 hours, sometimes entire days without their parents’ knowledge. Time passes, and no one knows where their child is. I read about this in a report published a few months ago by the Association for Civil Rights in Israel (ACRI) titled “One rule, two legal systems.” “I don’t owe you an explanation,” the policewoman told me, and continued walking down the street. From afar, one could mistake them for parents on an evening stroll with their son. Two police cars waited for them in the middle of the boulevard.